Charlie Chaplain has three films on this list. One of a few actors or directors (or in his case both) that AFI seemed to have a particular predilection towards. That isn’t to take awat from this, or any of his film’s originality. For they were all original, but let’s not forget that Chaplaim made his films in an era where practically everything set to celluloid was original. I know, how dare I suggest that the great Charlie chaplain was overrated. Ah but I do. 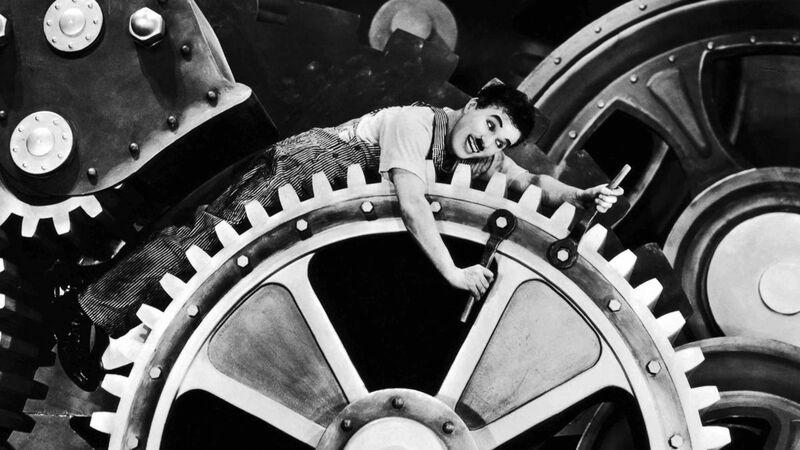 Not that he wasn’t a talented, hardworking director – not that he wasn’t a genius, but Modern Times is actually evidence of his limits. The film was released in 1937 almost ten years after sound had first been introduced to the motion picture, yet Chaplain still chose to make a silent film. I don’t believe that this decreases the film’s value today, but it does show an inability to adapt. It must be noted, however that he did use a steady stream of sound effects, musical numbers, and even a few specific lines throughout the movie. Yet this movie’s lack of sound was one of a few reasons this film didn’t do well critically or commercially when it was released, despite Chaplain himself being a household name at the time of its release. I personally found myself more frustrated by what felt like a constant insertion of physical comedy. If I were watching a movie that came out in the silent era I would expect this and be delighted when more sophisticated forms of humor arise. As this film was produced after the silent era I found myself being less patient with what seemed like needless sequences of silliness that failed to advance the plot or teach us anything new about the characters. I know. I’m watching this film through modern eyes, but I believe that was the same error that led the AFI to put this film on this list. Ironically Modern Times was behind the times at its release. now despite this, I want to be clear it is a great film, and worth watching. But it to be it represents an indulgent project by its director seeking to hang on to an era that had only recently passed.